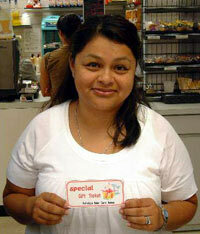 Erica Arreaga is this week’s winner of a Y5,000 gif coupon to Esthetiq Salon Come Across. 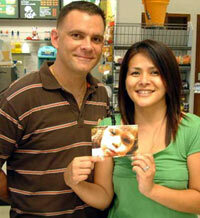 She’s from Lakewood, California, and has lived on Okinawa seven months. She says she likes sight seeing, but is basically a stay-at-home mother who enjoys being with her two boys and husband, doing occasionally some scrap booking. She also wants to say hello to all her family back in Lakewood and Pensacola. Thomas Niski won a \2,500 yen discount ticket to Kupu Kupu Spa. He has been on the island eight months, and says he likes the weather and laid-back lifestyle. He also says that although the life on Okinawa is not too bad, his favorite still is Germany. He spends his free time relaxing, BBQing and on the beach. He adds that he still has three years, three months and 15 days to go on Okinawa. 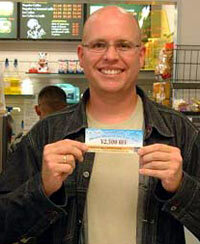 James Bolt is from Delany Beach, Florida, but has been on Okinawa 13 and half years so far. He says that his life here is great, “I wouldn’t want to live anywhere else as Okinawa is my new home with warm friendly people.” On his free time he likes to ride motorcycles and do some water sports, adding “Go GGOK & Zeroyon.” He won a \2,500 discount ticket to services of Jason Arbocast Photography.